Thursday’s second mini-safari was around NEWT’s local patch of Druridge Bay and southeast Northumberland. 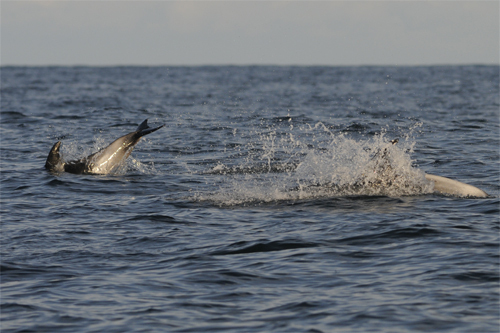 Our final full-day pelagic for 2012 was on Saturday and, although I was really looking forward to it, it’s always a shame when we reach the end of our offshore season. With strong winds on Thursday, and charter boats cancelling trips on Friday, I still felt that we’d be able to sail. We gathered at Royal Quays just before 09:00 and boarded the SarahJFK. Brian spotted a Great Spotted Woodpecker just after we set sail, and as we headed downstream we could see a little bit of swell and a few whitecaps offshore. A skein of Pink-footed Geese high overhead were heading south, and we weren’t too far out of the river when we had our first skua of the day; and it was one of those ‘is it, isn’t it?’ moments as what was probably a dark Pomarine Skua flew north low over the waves. Three Great Skuas were heading the same way, and another one later caused a ‘dread’ amongst the birds gathered round a fishing boat. 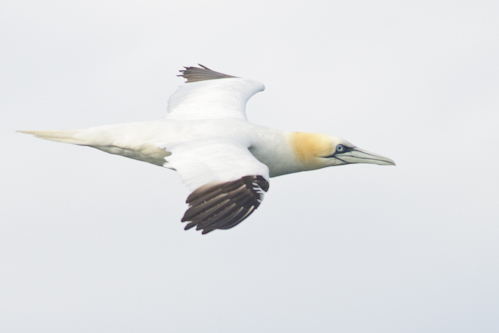 Fulmars and Kittiwakes were with us throughout most of the day and Gannets were soaring by on the breeze. 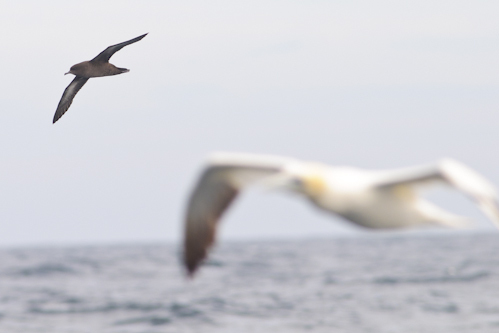 Our first Sooty Shearwater was in a raft of gulls behind a trawler, and we had at least five more during the day. As the swell began to ease slightly we were 8 miles off Cresswell, heading north west, when I saw two small waders flying up and over a wave crest. 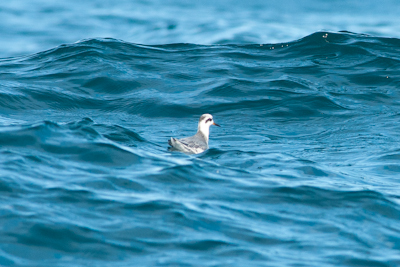 As they dropped onto the sea I shouted “Grey Phalaropes!” and called to Allan to stop the boat. 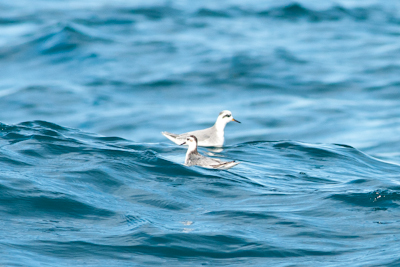 Eventually we all had excellent views of these two tiny birds as they bobbed about in the swell. 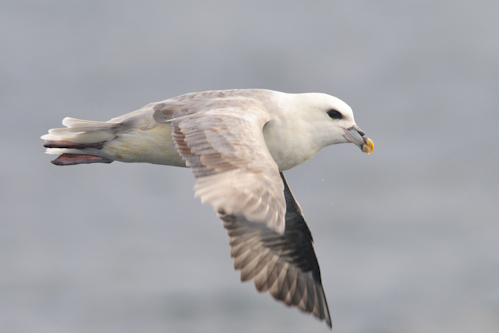 They were the 2nd and 3rd that I’ve seen on pelagics I’ve organised, following the 1st out in the Farne Deeps in 2010. When I was on the coast just south of Cresswell on Friday evening, I didn’t hold out much hope for Saturday’s pelagic going ahead; a menacing sea, with waves forming towering peaks, didn’t look likely to abate. However, the sea is often fickle and Saturday saw nothing more than a long, lazy swell as we set sail into the North Sea for a day of offshore birdwatching along the coastlines of Druridge Bay and southeast Northumberland. Conditions changed throughout the day with, at times, the sea as calm as a millpond. 3 ‘Blue’ Fulmars, 5 Great Skuas, a probable Pomarine Skua, 3 Arctic Skuas, 5 Sooty Shearwaters, 4 Red-throated Divers, 2 Manx Shearwaters, Teal, Puffins, Guillemots, Razorbills, Kittiwakes, Gannets, Mediterranean Gulls and Swallows! 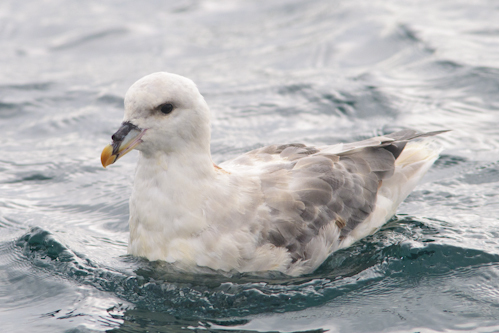 were all appreciated and a Grey Seal and 2 Harbour Porpoises added some mammalian interest. Saturday’s Whale and Dolphin Cruise from Seahouses turned out to be an excellent few hours of birdwatching off the Northumberland coast. Tuesday’s weather forecast was indicating something quite remarkable; a spell of nice weather between showers that would coincide exactly with our evening trip on Ocean Explorer. That’s just what we got and, after an afternoon of heavy rain, we boarded the RIB in excellent weather just after 6pm. 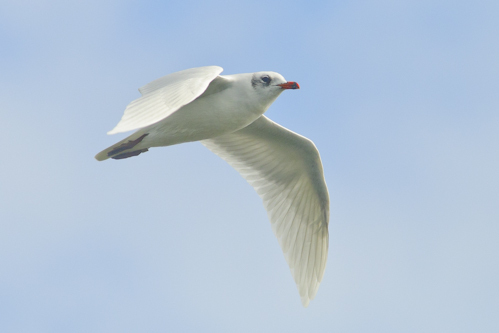 The excitement of a high-speed journey south along the Northumberland coast combined well with close observation of feeding flocks of Gannets, terns and gulls, including a breathtakingly beautiful adult Roseate Tern. A Harbour Porpoise surfaced twice just off Dunstanburgh Castle, which looked stunning from our offshore position, and at least 3 Pomarine Skuas were busy brutalising the terns. As planned, we finished our trip around the Farne Islands. As curious Grey Seals came to have a closer look at all on board, the menacing clouds to the west obscured the sunset but we were treated to a spectacular moonrise in compensation. The short journey back to the harbour produced excellent views of 2 adult Harbour Porpoises and a calf; an excellent way to end our evening. We’ve got another 3hr RIB trip on Thursday 25th August, so click here to book, or ‘phone 07908 119535 for more details. We’re waiting for your call, and looking forward to enjoying some of Northumberland’s wildlife with you. On Saturday morning our destination was Druridge Bay and southeast Northumberland and another poor weather forecast ( a bit of a running theme during the holiday…) suggested that we may well get wet. An addition to the mammal list for the trip raced across the road ahead of us; a Stoat – an endearing predator and one of NEWT’s favourite animals. We arrived in Amble for our sailing around Coquet Island with Dave Gray’s Puffin Cruises; as Dave manoeuvred the excellent Steadfast into the harbour, the rain arrived from the northeast. 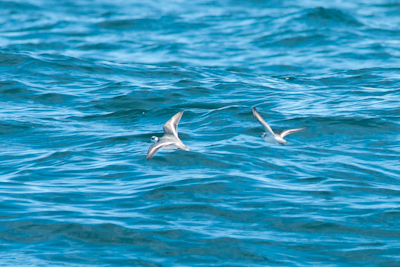 The sailing around the island produced excellent views of Roseate Terns, as well as Common, Arctic and Sandwich Terns, Gannets, Puffins, Razorbills and Guillemots. As we sailed in a wide arc from the island to begin the journey back to the harbour an Arctic Skua was harassing terns away to the north. Four more Arctic Skuas were followed by a real seawatching prize as a Pomarine Skua lumbered menacingly by before settling on the sea. Our final Arctic Skua flew over the harbour just before we docked and I suggested that the Country Barn Coffee Shop at Widdrington would be the best destination once we were back on dry land. Refreshed, dried and ready to go we visited the NWT reserve of East Chevington. The tern roost allowed close comparison of Common and Arctic Terns, but the bird described by one participant as ‘bird of the holiday’ was a superb male Marsh Harrier. A juvenile harrier appeared briefly over the reedbed as well, but the male perched for several minutes on a fence post. Just after we reached Druridge Pools, the heavens opened, lightning flashed, thunder rolled and 2 Wood Sandpipers bobbed along the edge of the main pool. A trip to Cresswell, and the most northerly breeding Avocets in England, followed and we all enjoyed views of a very obliging Brown Hare, Little Gulls and both Little and Great Crested Grebes. Another excellent evening meal and entertaining conversation (including David’s comment about Captain Birdseye in a cape..a reference to my appearance during the Coquet Island trip), concluded our final night in Seahouses. As I put my coffee cup and glass of orange juice on the table at breakfast on Sunday morning I looked out over the harbour and the words “it’s a glorious morning” were quickly followed by “and there’s a Spoonbill!”. Everyone rushed to the window to watch, as Northumberland delivered a fantastic finale to the holiday; poor weather forecasts, some stunning downpours, big seas, beautiful weather, iconic landscapes, excellent birdwatching…all in four days! Sunday and Monday illustrated the range of things that NEWT do on a regular basis. Sunday saw me leaving the office at 03:30 and driving to Alnwick. Highlight of the drive was a Barn Owl, hunting alongside the A1 near Eshott. After collecting Helen and Steve, two of our returning clients, we headed to Bamburgh, and a rendezvous with the sunrise. Landscape photography tuition was first on the menu, followed by some macro photography around the rock pools at low tide. All the while, the crowds were building further along the beach in the shadow of Bamburgh Castle, enjoying views of the Black Scoter just offshore. Once the sun was well above the horizon, and the shadows were getting too harsh, it was time to drive back to Alnwick. A walk around Choppington Woods in the afternoon produced plenty of butterflies, Small White, Large White, Small Tortoiseshell, Peacock and Comma, and the unexpected patch tick of Hooded Crow. We weren’t finished yet though, and an evening excursion in southeast Northumberland produced excellent views of 2 of our favourites; Tawny Owl and Badger. 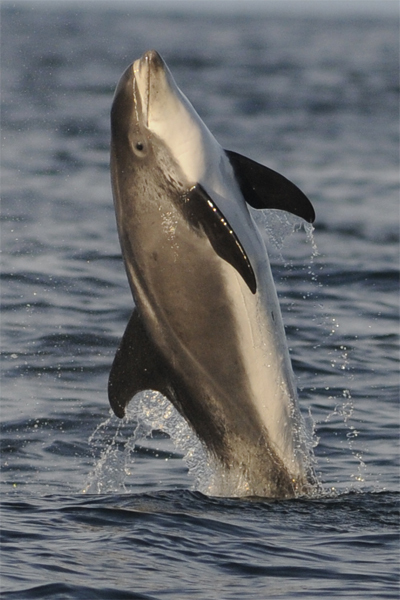 Yesterday morning, the day dawned overcast and calm; ideal for our latest Northeast Cetacean Project Transect Survey. I met up with Maeve, Claire, Rachael and Steve at Royal Quays and we set out on just about the flattest sea I’ve ever seen. Even 4 miles offshore it was glassy calm. 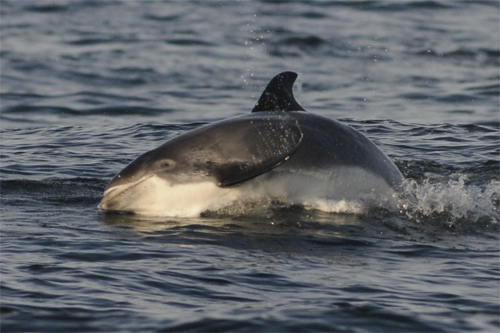 Cetacean sightings were down compared to the February/March surveys, with a pod of 4 Harbour Porpoises being the only sighting of the day. Avian highlights were our first Manx Shearwater and Pomarine Skua for the year, and lots of Puffins throughout the day.